You can create a stunning, lively, and eye-catching recipe blog with this theme without writing a single line of code. This theme features tons of customization option with live preview and allows you to design your blog as per your desire. Furthermore, it is speed optimized and SEO friendly theme which helps your website rank high in search engine results. You want an attractive and delicious looking WordPress recipe/food blog. You don’t want to write a single line of code to design your food blog. You want an easy-to-use theme for your yummy recipe blog. You are an aspiring chef and want to share your recipe ideas with the food lovers. You want to start your career as a food blogger. You want to create a beautiful feminine blog but do not have a budget to hire a developer. You are new in the field of website development and don’t want to invest a massive amount of money for a website. You don’t want to deal with the technical hassle caused while creating a food blog. Your client is a chef and wants a delicious looking recipe WordPress theme. You need a speed and SEO optimized template for your blog. You run a web agency, and your client wants a responsive and engaging blog. You need fast and reliable support while dealing with the issues in the process of creating a website. With Blossom Recipe Pro WordPress theme, you can display the cooking instructions step by step to allow your visitors to understand the cooking methods more clearly. Furthermore, the steps can be tick marked if completed to avoid the confusion. It is a great feature which would help your visitors follow your recipe step by step to prepare your yummy and delicious recipe. The theme allows you to display the cooking details such as difficulty, preparation time, time to cook the given recipe, and total time needed to complete the recipe. It would help your visitors to what is the difficulty level to cook the food, cooking time and total time needed to prepare the dish before they decide to prepare the recipe for themselves. Blossom Recipe pro WordPress theme allows your visitors to check the amount of ingredients required as per the number of people you want to prepare the dish for. It is a great feature that helps to use the appropriate amount of ingredients required as per your servings. This theme features a one-click print recipe option to allow your visitors to print their favorite recipe for offline access. Blossom Recipe Pro is fully compatible with Blossom Recipe Maker plugin to allow you to create a yummy and delicious recipe in a short time. With this plugin, you can add any food recipes to your posts and pages using the shortcodes. The theme allows you to display your recipe posts on the blog page. With this feature enabled, only recipe posts would be displayed on your blog page giving your recipes maximum visibility and your users multiple dishes option for their breakfast, lunch and dinner. The number of people that browse the Internet from their smartphones has increased exponentially. In fact, more than 50% of Google searches are done on mobile phones. So, you will be able to target every kind of audience with this fully responsive WordPress theme. Blossom Recipe Pro will automatically adjust itself to any screen sizes so that your blog always looks beautiful. Blossom Recipe Pro WordPress theme passes Google mobile-friendly test which will help you rank in the search engines as well. You can import all the images, text, and settings from the live demo of Blossom Recipe Pro theme with a click because we believe you should spend more time on your venture than on setting up your website. You can choose from 4 different header layouts in Blossom Recipe Pro. Make your website unique with attractive layouts. Blossom Recipe Pro offers 9 intuitive design layout for your homepage. You can display full-width homepage or homepage with left or right sidebar. You can also choose from the grid layout, the list layout, or the masonry layout. Blossom Recipe Pro features 4 slider layouts. You can display your banner slider in 4 different ways– single slide at a time, masonry layout with multiple slides at a time, single slide with a glimpse of two other slides, or the grid of slides. With Blossom Recipe Pro, you can display 4 different types of pagination. You can use Next/Previous, Numbered (1,2,3,..), Load More button, or Auto Infinite Scroll pagination style. However, you don’t have to worry about that with Blossom Recipe Pro WordPress theme because you can make your website load crazy fast with just a few clicks. Blossom Recipe Pro comes with easy to use built-in live customizer to help you customize your website with live preview. You can make changes to your website and see its preview without saving it using the live customizer. You can build your dream website within no time using live theme panel. Blossom Recipe Pro is developed using fonts that are easy on the eye. However, if you don’t like the default fonts, you can quickly change them from the live customizer. Show your bio on your blog to build a healthy relationship with your audience. You can easily add your photo along with a short description, your signature, and your social media profiles on the sidebar using Blossom Author Bio widget. Who doesn’t love social media? Blossom Recipe Pro allows you to integrate your social media profiles on your blog quickly. Grow your influence on Instagram, SnapChat, Twitter, Facebook, and Pinterest by adding your profile links to your website. Blossom Recipe Pro is fully compatible with Blossom Themes Email Newsletter plugin. You can easily add subscription form using the plugin. The theme’s newsletter section combined with the newsletter plugin will help you grow your email subscribers. Grow your influence with your Instagram posts! With Blossom Recipe Pro theme, you can easily integrate your Instagram to your yummy food blog and grow your followings. Blossom Recipe Pro theme is Schema ready so search engines will fall for your website. Blossom Recipe pro WordPress theme is a speed optimized theme, which means your website will load faster and your visitors will have a smooth browsing experience. You risk losing your potential customer if you have a slow and laggy website because people don’t like waiting, especially when there are other options available i.e. your competitors. Blossom Recipe Pro has an option that allows you to show the last updated date on the single post page. This feature will help you rank better in Google as Google prefers to rank recently updated posts. You can quickly add your Google ads on your blog. The theme comes with pre-built spots for advertisement so that you can easily monetize your blog. The ad spots are placed strategically so as to increase the click-through rate which will help maximize your earnings. Blossom Recipe Pro comes with an Advertisement section so that you can easily place ads on high conversion areas. This section easily lets you add an ad code or a custom image with a link. You can show your latest posts or posts from your favorite category in the banner section of the homepage. You can show up to 20 recent posts, posts of a category, latest recipes or recipe categories on the slider. The above-the-fold slider will increase the user experience. Also, Also, you can control the transition, loop, caption, image, and animation of the slider so that your blog looks cool! With Blossom Recipe pro theme, you can feature your recipes in the featured area section below the banner section. The featured area section allows you to display 4 featured recipes, 4 popular posts, and 4 latest posts in a tabbed display. Blossom Recipe Pro allows you to add a video on the banner section. A video is a great way of engaging your audience on your website. 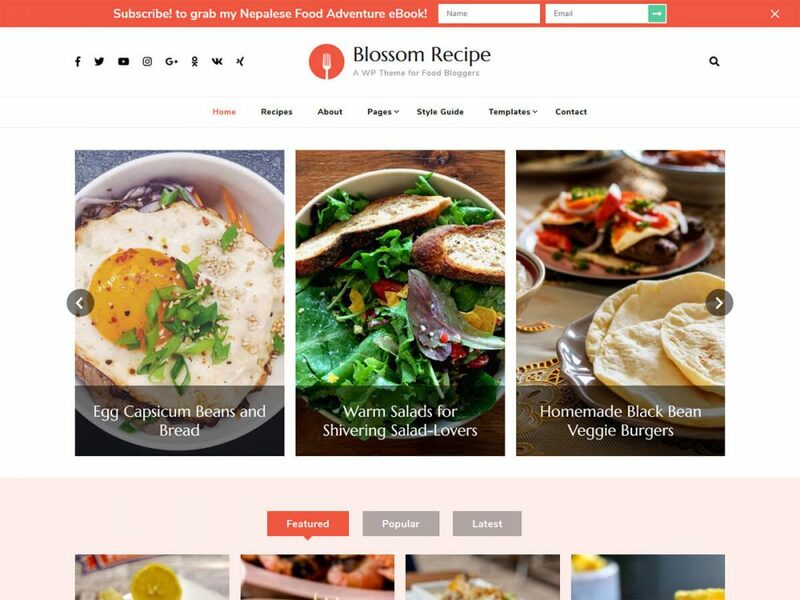 Blossom Recipe Pro WordPress theme allows you to display your social media links on your website so that your visitors can find you on social media. Social media on your website will also help you boost your business’ engagement. The theme also supports Russian and Chinese social media like OK, VK, Zing, qq, and others. You can add unlimited social media on your website. Having a social share buttons on the post helps you grow your audience because you have a chance to get trending on social media. Blossom Recipe Pro’s social share feature allows you to add Social Share buttons on the post page easily. With Blossom Recipe Pro, you can make your main navigation menu sticky so that visitors can access it at all time. This feature makes your website interactive. Blossom Recipe Pro has ample space for widgets. You can add and manage the widgets you require without compromising the design of the theme. Widget ready design and code allow you to customize your website as you desire easily. Blossom Recipe Pro is cross-browser compatible, which means the theme will work seamlessly with the popular web browsers. The theme is tested on Chrome, Firefox, Edge, and Safari. You don’t have to worry about any future theme updates as Blossom Recipe Pro comes with a one-click update button for stress-free updates. With the perfect font type, size, spaces, and contrast, Blossom Recipe Pro makes sure that your content is easy on the eye and your visitors enjoy reading what you have to say. Don’t let the language barrier come between you and your website. Blossom Recipe Pro theme supports localization so that you can use the theme in your local language. Do you use right-to-left (RTL) scripts like Arabic? Well, worry not! Blossom Recipe Pro supports both LTR and RTL languages. You can write content with confidence! You can easily add your own logo on your website using the Blossom Recipe Pro theme. Want to modify some CSS effect google fonts or the change color of a section? Blossom Recipe Pro allows you to easily add CSS effects right from the customizer. Blossom Recipe Pro WordPress theme comes with extensive theme documentation to help you set up your website. Just follow the step by step guidelines on the documentation and your website will be ready in no time.